Set of 2 porcelain mugs for him and her. 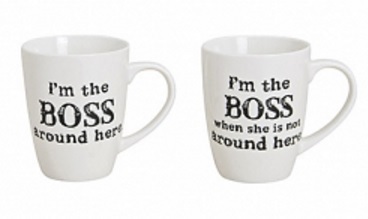 Her mug reads "I'm the boss", while his reads "I'm the boss when she is not around here". Funny gift idea for every couple. The given price is for the set of 2 mugs. Set sold in window gift box. Wonderful gift idea for the newlyweds. Great mug makes sipping your morning tea or coffee even better. Size: 23 x 8.5 x 13 cm.